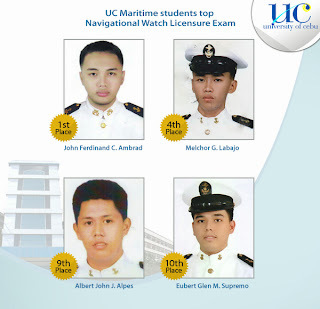 Five out of ten topnotchers in the Officer-in-Charge of a Navigational Watch Licensure Examinations given last July 27 and 28, 2013 are from the University of Cebu (UC). O.I.C.-Navigational Watch topnotchers include John Ferdinand C. Ambrad, first place; Melchor G. Labajo, fourth place; Sean Robert L. Nasiad, fifth place; Albert John J. Alpes, 9th place; and Eubert Glen M. Supremo, tenth place. The Professional Regulation Commission (PRC) announced that 764 out of 1,392 passed the Officer-In-Charge of a Navigational Watch Licensure Examination given last July 2013. This amazing feat by its maritime students shows the University of Cebu’s educational mantra of sustaining an attitude of excellence. These top performing students are products of UC’s quality education that is affordable at best. The University of Cebu offers thousands of academic, corporate, athletic and course-related scholarships. For maritime, UC is the only school in the Philippines with numerous foreign scholarships and more than 2,000 Filipino scholars availing.